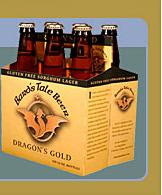 Dragon's Gold is the best beer ever (Gluten Free Class). OK this may not be true, as I only have had one gluten free beer in my life and it was this one. Which means, this is also the worst gluten free beer I've ever had as well. Let's stay with that thought. Did you ever have a sugar free cookie and it tasted awful? So you think, wow sugar is what makes cookies taste good. That's how I feel about about gluten right about now. The beer had no taste, no malted goodness at all. I wasn't the only one who thought this, someone else called it "not memorable. " Sure the redeeming thing about this beer is that it is made with sorghum instead of barley so people with Celiac's disease can drink it. I am clearly not a fan of this beer and its 4.7 ABV. The Bard's Tale gets a 1.5.